This week we’re hearing the 2017 3-Year Outlook Report for Anchorage, presented by the Anchorage Economic Development Corporation. It’s a look at the changes in Anchorage and it’s economy over the last few years, and what outlook is for our future. 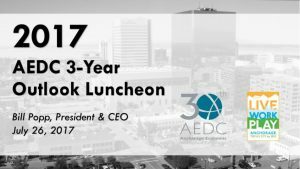 We’ll first hear from AEDC President and CEO Bill Popp. Later in the program, we’ll hear from Anchorage mayor Ethan Berkowitz and special guest Abhi Nemani. Abhi Nemani, interim Chief Innovation Officer for Sacramento, CA. Web site with the reports and video of the event.